Journey along in nine historical romances with those who lives are transformed by the opulence, growth, and great changes taking place in America s Gilded Age. Nine couples meet during these exhilarating times and work to build a future together through fighting for social reform, celebrating new opportunities for leisure activities, taking advantage of economic growth and new inventions, and more. Watch as these romances develop and legacies of faith and love are formed." 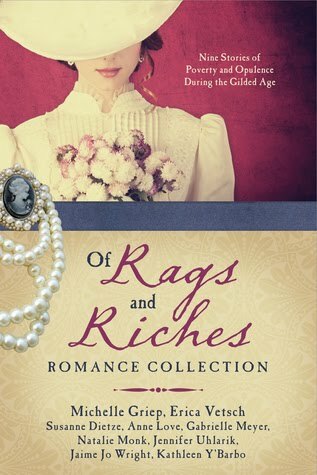 Of Rags and Riches is a great collection of nine romance novellas from some amazing authors who will invite you to be apart of amazing places, romances and stories that you will love. These are fantastic reads! Head back to 1867 to the Dakota territory where we meet Dara and Gage who face danger on the rugged country as the railroad is not yet complete. Dara embarks on a journey with her father, but finds herself being rescued more than once by a man who isn't her father. Will money be an issue or will love be enough to sweep her off her feet? The Right Pitch by Susanne DietzeGet ready to head to Philadelphia, Pennsylvania as baseball becomes the focus of this book. Women weren't allowed to play before this time, because it was a gentleman's sport, but leave it to Winnie to play for the Children's Hospital. She isn't just your average glamorous woman, but one who is willing to get dirty. Enter Beck Emerson into the picture who is wounded from the war, but finds common ground with Winnie. Will baseball strike out a love story ? It's March 1871 in New Orleans, Louisiana when Sam Austen and May Bolen are forced to meet after the passing of her father. His will stated that they would meet and also that they would marry. Of course, we know that arranged marriages never work out, but can both Sam and May get past the will and learn forgiveness? Will they discover a love that lasts forever? Or will it just be to satisfy a will requirement? I would have have loved to read more of this story in a longer version, but that is my opinion. Get ready for an amazing story of survival, forgiveness and reconciliation as we meet Elle who is from Poland and really wants to look for Mr. Right and by Mr. Right, I mean Mr. Rich to get her family to America. However, rather than Mr. Rich, she meets the most caring man who has a heart for orphans. Will Elle choose her heart or wealth to bring her family to the US? I love the heart of Woody in this story and how he helped Ella with translations... Great story.. Read it! Joseph and Amanda, engaged are helping those of St. Paul who are the least of these. Their hearts are so big. Amanda wants to do whatever she can to help and is quite strong in her thinking. She wants to open a school for children who are less fortunate, while Joseph is the city attorney and wants to shut down a brothel. Of course this couple who wants to stand up for social injustice is thrown curve balls as they face challenges and even an unexpected person that I didn't see coming. This story was more adventures than I thought it would be and the mysteries of this story was great! I loved the romance between Beryl and Gard in Win and Draw. A younger woman, Beryl who has a love. for horses, especially Lacey and is not like other women in society during this time. She doesn't follow the same social standards as this era, especially as her mother tries to set her up with eligible bachelors who are "suitable", but they don't fit with who Beryl is. I love how Gard and her meet and their commonality. I won't say anymore to give this sweet novella away. Living in the woods of Wisconsin, Abby and her father have a business where people go out adventures and this how they make money to survive. One man comes to stay with them, Charles the third to get some peace and quiet from his life. Will Abby find a way to Charle's heart in the woods despite all that is going on with him? Will she be able to face her past? I love that this story of Maggie was set in Michigan. Maggie is a library assistant who's faith can't be shaken and her personality is kind. She is taking care of her father, but is also asked by a professor to tell the stories of his students. Will a story unfold between the professor and Maggie or will she have to choose her father? I thought this story had an interesting pace. It was fast at times and slower at other times. Is love boiling between Lucy Taylor and Eli Boyer? Oh, this one had me in stitches! Get ready to get in the driver seat and watch a woman who is willing to do anything to help her family in their time of need to help provide.... This one is fantastic!